Inside Jackson State University’s Gallery1, a quiet concentration infused the room; heads were bowed, pencils tightly clenched in small hands and eyes fixated on white sheets of paper. 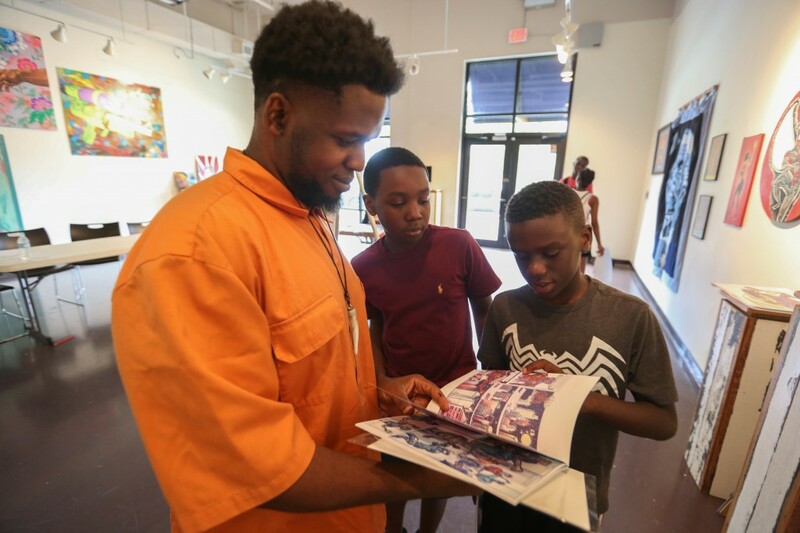 Comic book illustrator Kwame Braxton moved patiently from child to child studying each picture with sage intensity and offering instruction. “I love what I do,” he said. 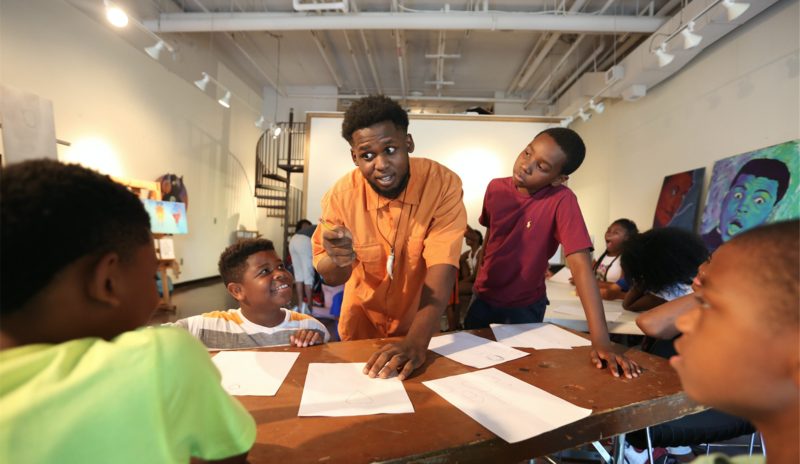 From June 8-July 13, students from Hinds County Public Schools – kindergarten to ninth grade – participated in the “Summer Art Institute” hosted by Gallery1, Jackson State’s Kids Kollege, the College of Education and Human Development and the College of Liberal Arts. 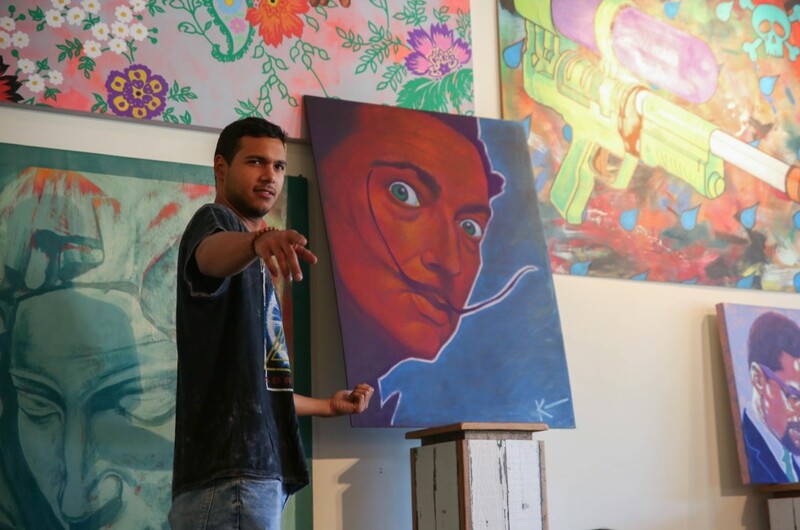 Over the course of six weeks, visual artists Kenan Mason taught the elements of pop art; Shambe Jones showcased woodcarving and T-shirt design; Zederick Wilson shared collage making; and Braxton presented comic book composition. “It’s important that we keep doing this every summer because we don’t see too many more of these services offered in our community,” said Shonda McCarthy, director of Gallery1. The fundamental dualism of the institute serves to expose children to creative arts and constructive representations of themselves. McCarthy explained that the deliberate selection of all African-American male teachers for the camp was intended to combat the adverse portrayals of black men in the media. 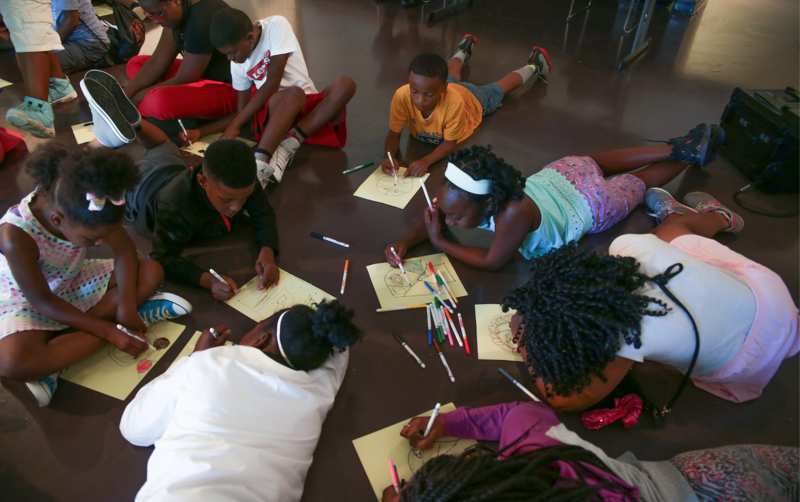 “Kwame creates comic book characters of positive African-Americans. Unfortunately, we don’t see a lot of positive African-American images in a lot of comic book illustrations or animations,” said McCarthy. At the age of 6, Braxton discovered his affinity for comic books. “I liked the way comics could blend literature and artistry at the same time. My Uncle Brian gave me the gift of teaching. He showed me how to draw and also showed me that artistry is not necessarily limited to just one form,” said Braxton, whose comic book “God of Kings” can be purchased at Offbeat. Growing up with his father, Charlie Braxton – a noted poet, writer and playwright, the younger Braxton divulged that his home environment was an embodiment of art and culture that aroused his creativity. A further ability to influence attitudes about black people also factored into his desire to explore comic books, which he describes as a genre characteristic of “nerds” or “sci-fi lovers” that later made a leap to the mainstream. “I saw that this would be the perfect opportunity to try and change the way we’re perceived for the next generation of black people. Children tend to gravitate toward bright colors and flashy, over-the-top extravagant ideas,” he said. Braxton explained that the penchant for adults to be staunch in their opinions and thought patterns is an ancillary reason his audience consists of children. He agrees that their impressionistic nature increases his odds of transforming negative self-perceptions into positive through varied mediums. The illustrator expressed that a “cookie-cutter” physique is unrealistic and not reflective of a culturally diverse community. He further stated that he produces strong black male protagonists in efforts to diminish emasculating depictions. “We’re either going to be someone’s sidekick, servant or villain. Or, we’re so psychologically destroyed to the point that we do not know how to convey emotion or we’re an idiot who is self-destructive,” he said. Ultimately, Braxton would like to teach, own an art studio and a publishing company where he could continue to touch on polarizing issues that at least stimulate discussion. When it comes to funding, he wants decision-makers to understand that art is a good investment, especially for Mississippi – a state that Braxton said is plagued by a reputation for poor education rankings, close-mindedness and blatant racism. 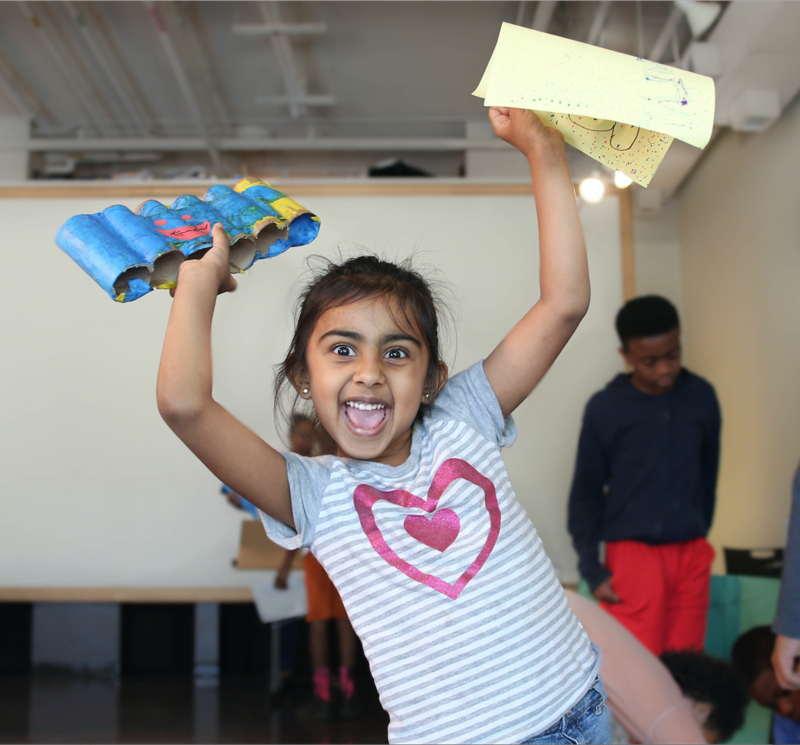 He suggests that art is an ingenious tool for breaking barriers and without it most children would not have a viable creative outlet aside from social media that can eventually lead to technological quagmires that make some people socially inept. “Art is great, it is also relevant no matter the time period. If you can create something, you have the power to direct your message and possibly change the trajectory of our youth for the better,” he said.